The fight game and the sneaker game briefly collide in Las Vegas at the UFC 141 weigh-ins. While mammoth heavyweights Brock Lesnar and Alistair Overeem prepare to clash tonight at UFC 141, last night's weigh-in event provided a glimpse of the rare (but increasingly more common) collision between the fight game and the sneaker game. Sneakers, understandably, don't have a large presence during fights (under the Unified Rules, competitors cannot wear shoes in the octagon); however, they do make an occasional appearance at the weigh-ins, as was the case last night at the MGM Grand Garden Arena. 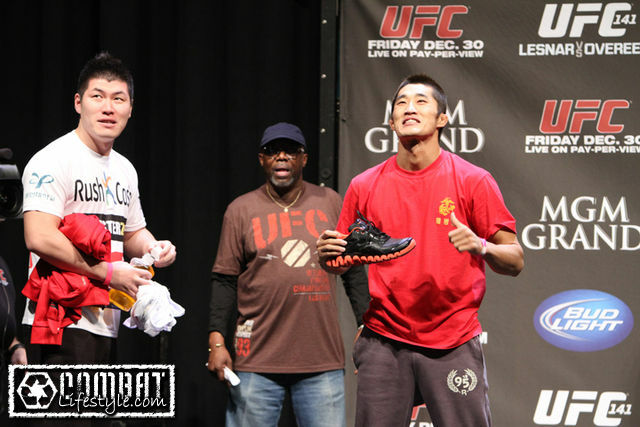 First, Dong-Hyun Kim, a Reebok-endorsed fighter from South Korea, made sure his Zig runners were visible for the cameras, weighing in at 171-pounds for his welterweight bout with Sean Pierson. 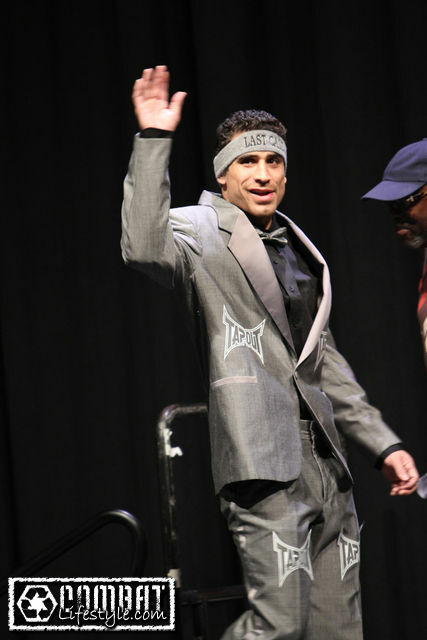 One-upping Kim, Danny "Last Call" Castillo (likely the biggest sneakerhead in all of MMA) executed another humorous weigh-in, this time complimenting his tear-away tuxedo with the Cool Grey Air Jordan 11. Castillo will face off against Anthony Njokuani in a lightweight fight on the Spike TV portion of the card. In the main event, K-1 champion Alistair Overeem (263) meets NCAA wrestling champion Brock Lesnar (266). Will Lesnar successfully utilize his elite grappling and smothering top control, or will The Reem end things early with his world-class striking game? Take a look at the photos below, and be sure to leave your fight picks in the comments section.